From the folks at the Crown Heights Assembly. Petition available here. Activists from the Crown Heights Assembly push the City Council to address neighborhood displacement. Brooklyn, NY - In light of the neighborhood’s rapid gentrification and the Bloomberg administration’s proposal to upzone the Franklin Avenue corridor, the Crown Heights Assembly and over 700 residents of Crown Heights have signed a petition to demand the construction and preservation of housing for the working class in our neighborhood. In just two weeks, a Crown Heights Assembly (CHA) petition over the proposed rezoning has received over 500 signatures online and another 200 signatures in print. “The amount of interest in this petition demonstrates how incredibly important the issue of affordable housing is to the neighborhood,” says CHA member Elana Bulman. Crown Heights saw the largest increase in rents in any Brooklyn neighborhood in 2011, with average rents going up 35.0% for studios, and 26.2% for one bedroom apartments. The Crown Heights Assembly launched a petition to City Councilmember Letitia James calling for working-class housing and stronger protections against tenant harassment in a rezoning that neighborhood activists say is likely to raise rents, lead to building demolitions, and result in increased pressure for long-term residents to move out of the neighborhood. 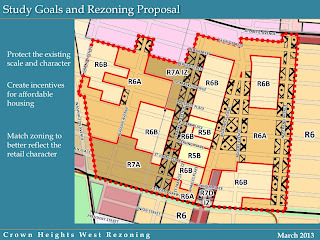 The proposed Crown Heights West Rezoning incorporates Inclusionary Zoning, a voluntary incentive for developers to designate 20% of the units as affordable for low- and moderate-income residents, in exchange for the right to build with more floor area. However, reports released last week by Councilmember Brad Lander’s Office and the Association for Neighborhood and Housing Development found that just 2,769 affordable housing units were produced under the voluntary Inclusionary Zoning program between 2005 and 2013. This is less than 13% of the number of market-rate multifamily units built in Inclusionary Zoning “Designated Areas.” In Brooklyn, outside of the Greenpoint-Williamsburg rezoning, only two projects have taken advantage of the inclusionary zoning incentive, for a total of just 86 affordable units. CHA demands mandatory inclusionary zoning to achieve maximal housing for the poor and working class. CHA rejects all development that results in displacement, and salutes Community Board 8 in calling for mandatory obligations on developers to build low- and moderate-income housing for the community. The Crown Heights Assembly also calls for an Anti-Harassment Area, which would necessitate the Department of Housing Preservation and Development to investigate whether harassment occurred before a Department of Buildings permit is granted for a demolition or substantial modification, as was established in the Special Clinton District and Greenpoint-Williamsburg rezonings. Today's commemorations of the fiftieth anniversary anniversary of the March on Washington for Jobs and Education focused primarily on Dr. Martin Luther King Jr.'s "I Have A Dream" speech. The speech, and Dr. King, merited this attention, and you can watch the complete speech above, but in thinking about the March on Washington, the historian in me wanted to offer some additional sources that help to add depth and complexity to its legacy (starting, of course, with the name: the march was for JOBS and freedom, which is too often forgotten). The NYTimes ran an op-ed with a similar focus from historian Mary Dudziak earlier today, which is also a good place to start. The vision of a March on Washington as part of civil rights campaign was first developed by trade unionist and civil rights leader A. Philip Randolph, who used the threat of such a protest to force FDR to sign Executive Order 8802, which brought the Fair Employment Practices Commission into existence in 1941. When the plan for a March on Washington was revived during the civil rights movement, Randolph and his longtime colleagues - Bayard Rustin, Norman Hill, and others - were the lead organizers. At the March, Randolph read the pledge (video below), which captures his vision of mass democratic non-violent protest as an instrument for social, political, and economic progress. Bayard Rustin, Randolph's longtime friend and fellow organizer, was the chief organizer of the March on Washington. One of the movement's most important theorists and strategists, Rustin was often an off-camera hero, but in the clips below, you can hear him articulating his own vision of a free and equal society. Walter Reuther, the progressive president of the United Auto Workers, was a key supporter and organizer of the march, and lend his union's clout to the proceedings, insisting that the struggle for jobs and freedom was of the utmost importance for ALL Americans. You can hear his speech below. His presence at the march is a reminder of the trade union lineage of civil rights organizing (as best exemplified by Rustin and Randolph), as well as of the power of a left-labor alliance that activists have tried hard to recapture in the intervening half-century. John Lewis, the last living speaker from the original march, spoke this weekend about the legacy of the protest. Back in 1963, Lewis was a 23-year-old student leader with the Student Non-Violent Coordinating Committee, and his years of work on the front lines in the Deep South had radicalized his vision, as well as those of his fellow student activists. Lewis prepared to give a pointed, radical speech at the March, but was pressured by liberal activists, including Reuther, to tone down his rhetoric at the last minute. The original text of Lewis's speech survived, and is performed below by Danny Glover (introduced by the late Howard Zinn). The words are a valuable reminder of the challenges faced by Black Americans and civil rights activists in 1963, many of which persist today. Finally, the March was a global event, one that inspired similar marches around the world. Claudia Jones, a Trinidadian-born, Harlem-educated activist who was later deported to Britain in the McCarthy era, led a March on London that expressed Black British solidarity with the American struggle and made demands of its own upon the British government (among them a repeal of the 1962 Commonwealth Immigration Act and justice for murdered Antiguan carpenter Kelso Cochrane). You can hear Ms. Jones speaking below. ILFA will be out of town this week - postings will resume August 26th. Lots of good stuff going on this week. ILFA's on vacation, so posts may be even more intermittent than usual. Also, it's worth linking the just-released verdict in Floyd v. City of New York, which affirms what many Crown Heightsers have known for a long time: as conducted by the NYPD under Ray Kelly and Michael Bloomberg, stop-and-frisk is unconstitutional. - First, local artist and designer Mike Perry has designed a mural for PS 705, and they'll be painting it at the school (on St. Marks and Classon) from 10am-6pm tomorrow (Tuesday), Wednesday, and Thursday. They're looking for volunteers - if you're free consider helping out (and come prepared to get dirty). - Next up, the Franklin Park Reading Series returns tonight at 8pm, with their usual $4 drafts and world-class readers. Featuring readings by Rosalie Calabrese, Michael K. Dorr, Andrew Spano and Robert Viscusi. Hosted by Michael Graves. Open Reading follows. Sign Up @ 7. ROSALIE CALABRESE she writes poetry, short stories, and books and lyrics for musicals. Her poems have appeared in Cosmopolitan, Poetry New Zealand, Poetica, Jewish Currents, Jewish Women’s Literary Annual, And Then, Möbius, Genie, Thema, Phoenix, The Mom Egg, The New York Times, Critical Sociology, Psychoanalytic Perspectives and several other publications, including anthologies and on the Web. Michael K. Dorr is a playwright & short story writer; a veteran editor & former publisher; an educator who conducts poetry workshops in psychiatric hospitals and other venues; and the founder of the literary agency LitPub, Ink. He is editing THE COMPLETE SHORT STORIES OF BRAM STOKER and the co-editor of Miles On Miles: Interviews & Encounters with Miles Davis. But he is first and always, a poet. ANDREW SPANO's poetry and fiction has appeared in Death Panel, Roughwood Literary Journal, P2/Fort Point, The Endicott Review, The Pelham Parkway Times, The Emerson Review, Conifers, Heartland Magazine, Burlington Review, Milkweed Chronicle, and PKA’s Advocate, Bridge, Challenger International, Chantarelle’s Notebook, Down in the Dirt, Love’s Chance, Ceremony, Challenger International, Ceremony, Nut House, The Oak, Black Heart, and his work won Third Prize in the Artists Embassy International Sixteen Annual Dancing Poetry Contest in 2009. Were you a high school graduate anxious to flee your parent's home so you enrolled in a university that cost way more money than you had but because you were ill-educated on the difference between federal and private loans you asked sallie mae for money all willy nilly because it was easy to do so? Are you now suffering from exorbitant interest rates making huge monthly payments but not even chipping at the balance? Yep, us too. Join us in a barter with sallie. It’s easy. We work for her, she relieves some of our debt. Come drink beer with us while we all write barter cover letters to sallie in an attempt to barter down our debt as a collective. You're not alone! Donations welcome as they keep LaunchPad rolling! 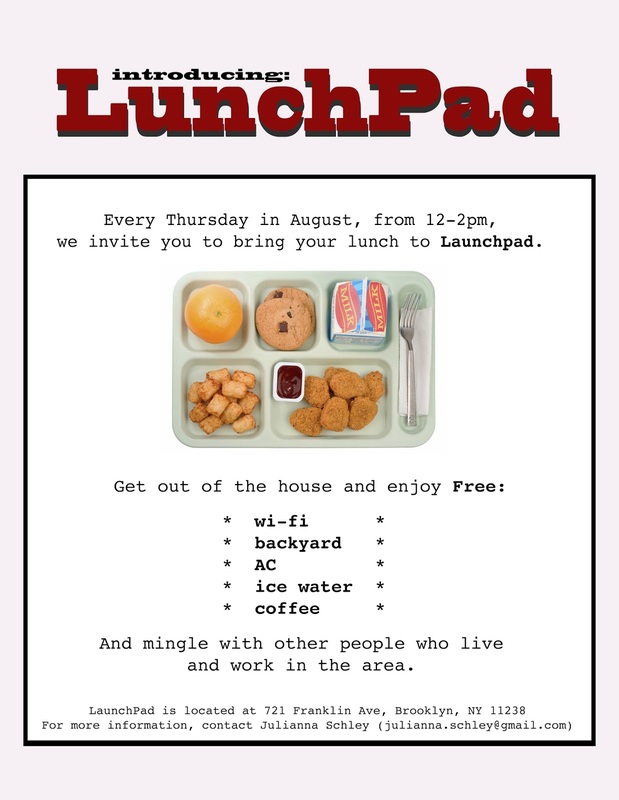 Every Thursday in August from 12-2pm, we invite you to bring your lunch to LaunchPad. Get out of the house and enjoy free wi-fi, backyard, A/C, ice water and coffee. 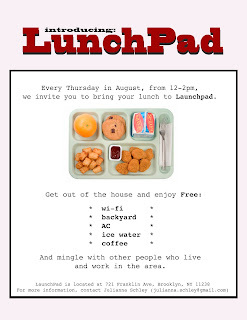 And, mingle with other people who live and work in the area! Are you an adult just because you filed your own taxes? Maybe. But probably not. 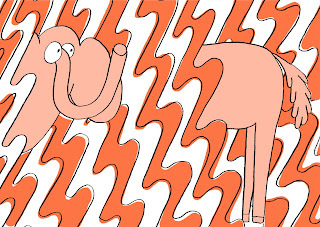 The quarter life crisis is simultaneously soul-sucking and completely absurd. All Gone Theatre Company's original project invites you to join us as we explore the validity of this existential period amidst the whirlwind of pseudo adulthood. Despite the turbulent nature of a quarter life crisis, we want you to enjoy yourself, so we will be providing some fun yet classy complimentary adult beverages. Run time is under an hour. Additionally, as a prequel to the performances, we will be hosting a concert/preview exhibit on Friday, August 16th at 9PM. Stop by to listen to some quarter life inspired acoustic tunes and get a sneak peak at the creative morsels behind the development of Quarter Life. 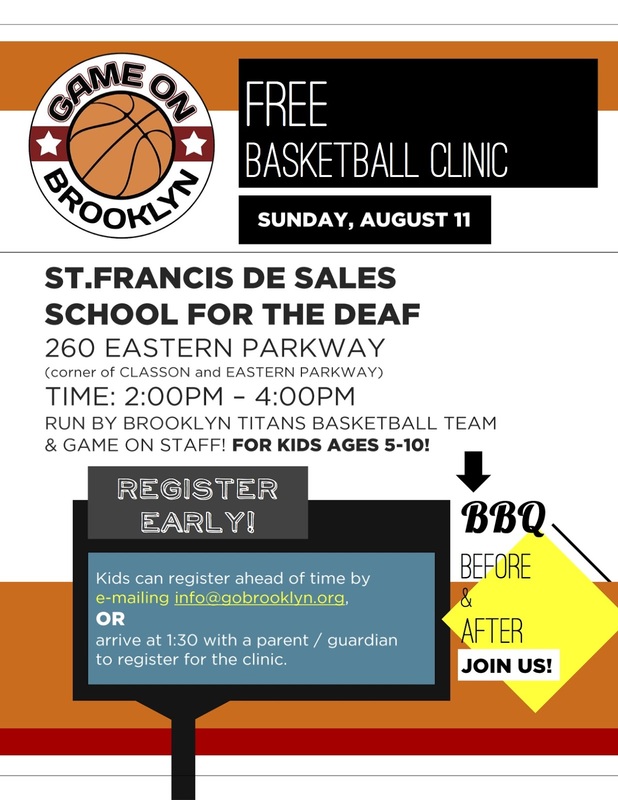 Game On Brooklyn, a local youth-oriented not-for-profit organization, is hosting a free basketball clinic and barbecue this Sunday, August 11, from 12-5pm at St. Francis De Sales School on Eastern and Classon. Complete details are on the flyers above. They're still looking for volunteers to help out with the basketball clinic and to help with the cookout (either baking or cooking something to bring or helping out on-site), so if you're around on Sunday, consider helping them out. 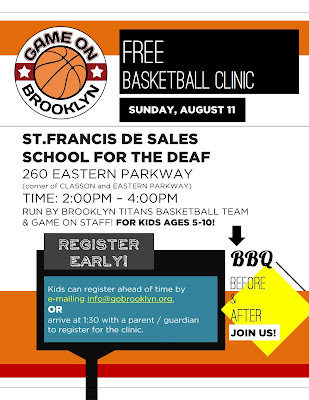 If you'd planned to volunteer at the annual Kids Day and were sad when it didn't happen this year (the organizers were swamped with other commitments this year, but promise it will return next year), here's a great chance to volunteer with local youth and have a great day out, too. You know how this goes! We love each other! We love improv! 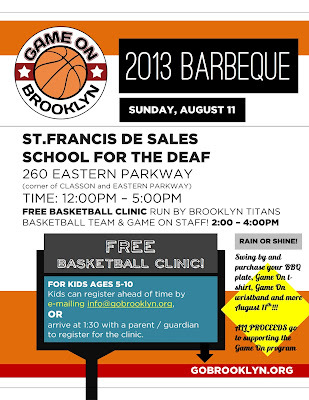 You should come to this awesome place in Brooklyn and enjoy the crap out of the aforementioned details! A table-read is one of the most valuable forms of feedback in screenwriting. The Screenwriters Meet-Up is a place for writers to bring screenplays or scenes to read out loud and workshop with other writers. If necessary, we ask that people with longer scripts (30+ pages) have specific scenes picked out so we can accommodate a higher number of people present at a given session. Everyone is welcome, including beginners or actors who only want to read. Join us for a fun activity open to all that combines aerobic exercise with simple dance moves. Set to different types of music, come to learn new moves, show off your old moves, or just get your heart rate up while meeting new friends. All levels are welcome, leotards and leg warmers optional. - Jonathan Butler, founder of Brownstoner and the Brooklyn Flea, sat down for a thoughtful interview with the Observer earlier this week about his latest Brooklyn-based venture, 1000 Dean Street. - Tablet reports that Crown Heights is home to the offices of a new, American Idol-style singing competition for Orthodox Jews around the world, titled "A Jewish Star." - Tablet also did a podcast with Bulletproof Stockings, a Hasidic alt-rock duo who hails from the neighborhood. - The L Magazine was the latest in a long line of local news outlets to write on the explosive rise of rents in Crown Heights, picking up on DNAInfo's coverage of the CHCA Affordable Housing meeting last week. Brownstoner ran a similar post, asking whether "gentrifiers are gentrifying gentrifiers." As they tweeted this morning, Pulp & Bean II has officially opened (after a soft opening yesterday) across Eastern Parkway on Franklin between President and Carroll. ILFA was there when the first P&B opened in 2009, back when a coffee shop on Franklin Avenue was considered so unlikely both the NYT and the Daily News came out and wrote about it. While this opening won't grab the same level of attention from the city press, most likely, it's still something new for those living south of the Parkway. Readers, who's been in? Thoughts?